InVade Bio Foam eliminates scum, odors and organic build-up in commercial kitchens. It is the ultimate “green cleaner,” the company says — containing premium, natural microbes, foaming agent and natural citrus oil. The powerful microbes actually digest organic matter. The foam provides an extended contact time for the microbes to work. 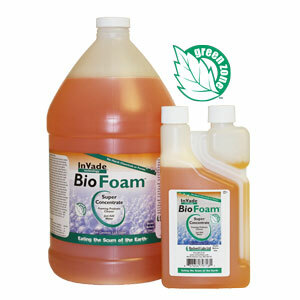 InVade Bio Foam is diluted with water at a rate of 1 ounce to 1 quart or 4 ounces to 1 gallon, with the easy squeeze-n-measure bottle or 1-gallon jug with pump top. InVade Bio Foam is designed to integrate with the Foamer Simpson Pump-up Foamer or a power foamer for application.